"Libyan Civil War" redirects here. For other uses, see Libyan Civil War (disambiguation). Libyan oil production collapsed during the two civil wars. The history of Libya under Muammar Gaddafi spanned 42 years from 1969 to 2011. Gaddafi became the de facto leader of the country on 1 September 1969 after leading a group of young Libyan military officers against King Idris I in a nonviolent revolution and bloodless coup d'état. After the king had fled the country, the Libyan Revolutionary Command Council (RCC) headed by Gaddafi abolished the monarchy and the old constitution and proclaimed the new Libyan Arab Republic, with the motto "freedom, socialism, and unity". After coming to power, the RCC government took control of all petroleum companies operating in the country and initiated a process of directing funds toward providing education, health care and housing for all. Despite the reforms not being entirely effective, public education in the country became free and primary education compulsory for both sexes. Medical care became available to the public at no cost, but providing housing for all was a task that the government was not able to complete. Under Gaddafi, per capita income in the country rose to more than US$11,000, the fifth-highest in Africa. The increase in prosperity was accompanied by a controversial foreign policy and increased political repression at home. In early 2011, a civil war broke out in the context of the wider "Arab Spring". The anti-Gaddafi forces formed a committee named the National Transitional Council, on 27 February 2011. It was meant to act as an interim authority in the rebel-controlled areas. After the government began to roll back the rebels and a number of atrocities were committed by both sides, a multinational coalition led by NATO forces intervened on 21 March 2011, ostensibly to protect civilians against attacks by the government's forces. Shortly thereafter, the International Criminal Court issued an arrest warrant against Gaddafi and his entourage on 27 June 2011. Gaddafi was ousted from power in the wake of the fall of Tripoli to the rebel forces on 20 August 2011, although pockets of resistance held by forces loyal to Gaddafi's government held out for another two months, especially in Gaddafi's hometown of Sirte, which he declared the new capital of Libya on 1 September 2011. His Jamahiriya regime came to an end the following month, culminating on 20 October 2011 with Sirte's capture, NATO airstrikes against Gaddafi's escape convoy, and his killing by rebel fighters. The Libyan revolution led to defected regime military members who joined rebel forces, revolutionary brigades that defected from the Libyan Army, post-revolutionary brigades, militias, and various other armed groups, many composed of ordinary workers and students. Some of the armed groups formed during the war against the regime and others evolved later for security purposes. Some were based on tribal allegiances. The groups formed in different parts of the country and varied considerably in size, capability, and influence. They were not united as one body, but they were not necessarily at odds with one another. Revolutionary brigades accounted for the majority of skilled and experienced fighters and weapons. Some militias evolved from criminal networks to violent extremist gangs, quite different from the brigades seeking to provide protection. After the first Libyan civil war, violence occurred involving various armed groups who fought against Gaddafi but refused to lay down their arms when the war ended in October 2011. Some brigades and militias shifted from merely delaying the surrender of their weapons to actively asserting a continuing political role as "guardians of the revolution", with hundreds of local armed groups filling the complex security vacuum left by the fall of Gaddafi. Before the official end of hostilities between loyalist and opposition forces, there were reports of sporadic clashes between rival militias and vigilante revenge killings. In dealing with the number of unregulated armed groups, the National Transitional Council called for all armed groups to register and unite under the Ministry of Defense, thus placing many armed groups on the payroll of the government. This gave a degree of legitimacy to many armed groups, including General Khalifa Haftar who registered his armed group as the "Libyan National Army", the same name he used for his anti-Gaddafi forces after the 1980s Chadian–Libyan conflict. On 11 September 2012, militants allied with Al-Qaeda attacked the US consulate in Benghazi, killing the US ambassador and three others. This prompted a popular outcry against the semi-legal militias that were still operating, and resulted in the storming of several Islamist militia bases by protesters. A large-scale government crackdown followed on non-sanctioned militias, with the Libyan Army raiding several now-illegal militias' headquarters and ordering them to disband. The violence eventually escalated into the second Libyan civil war. The second Libyan civil war is an ongoing conflict among rival groups seeking control of the territory of Libya. The conflict has been mostly between the government of the Council of Deputies that was elected democratically in 2014 and internationally recognized as the "Libyan Government", also known as the "Tobruk government"; and the rival Islamist government of the General National Congress (GNC), also called the "National Salvation Government", based in the capital Tripoli. In December 2015 these two factions agreed in principle to unite as the Government of National Accord. Although the Government of National Accord is now functioning, its authority is still unclear as specific details acceptable to both sides have not yet been agreed upon. The Tobruk government, strongest in eastern Libya, has the loyalty of Haftar's Libyan National Army and has been supported by air strikes by Egypt and the UAE. The Islamist government of the GNC, strongest in western Libya, rejected the results of the 2014 election, and is led by the Muslim Brotherhood, backed by the wider Islamist coalition known as "Libya Dawn" and other militias, and aided by Qatar, Sudan, and Turkey. In addition to these, there are also smaller rival groups: the Islamist Shura Council of Benghazi Revolutionaries, led by Ansar al-Sharia (Libya), which has had the support of the GNC; the Islamic State of Iraq and the Levant's (ISIL's) Libyan provinces; as well as Tuareg militias of Ghat, controlling desert areas in the southwest; and local forces in Misrata District, controlling the towns of Bani Walid and Tawergha. The belligerents are coalitions of armed groups that sometimes change sides. Since 2015, there have been many political developments. The United Nations brokered a cease-fire in December 2015, and on 31 March 2016 the leaders of a new UN-supported "unity government" arrived in Tripoli. On 5 April, the Islamist government in western Libya announced that it was suspending operations and handing power to the new unity government, officially named the "Government of National Accord", although it was not yet clear whether the new arrangement would succeed. On 2 July, rival leaders reached an agreement to reunify the eastern and western managements of Libya's National Oil Corporation (NOC). As of 22 August, the unity government still had not received the approval of Haftar's supporters in the Tobruk government, and on 11 September the general boosted his political leverage by seizing control of two key oil terminals. Haftar and the NOC then reached an agreement for increasing oil production and exports, and all nine of Libya's major oil terminals were operating again in January 2017. ^ "Libya – Crisis response", European Union. ^ Fadel, L. "Libya's Crisis: A Shattered Airport, Two Parliaments, Many Factions". 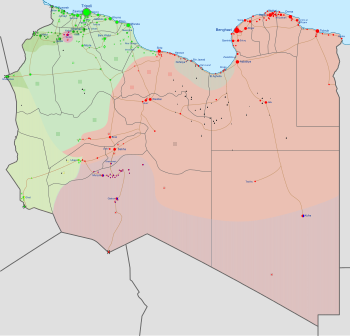 ^ a b "Country Analysis Brief: Libya" (PDF). US Energy Information Administration. 19 November 2015. Retrieved 14 April 2016. ^ "President Obama: Libya aftermath 'worst mistake' of presidency". BBC. 11 April 2016. Retrieved 25 April 2016. ^ "African Countries by GDP Per Capita > GDP Per Capita (most recent) by Country". NationMaster. Retrieved 24 July 2011. ^ Winslow, Robert. "Comparative Criminology: Libya". Crime and Society. San Diego State University. Archived from the original on 7 August 2011. Retrieved 24 July 2011. ^ Smith, David (12 September 2011). "Murder and torture 'carried out by both sides' of uprising against Libyan regime". The Guardian. Retrieved 29 November 2016. ^ Fahim, Kareem; Kirkpatrick, David D. (23 February 2011). "Qaddafi's Grip on the Capital Tightens as Revolt Grows". The New York Times. Retrieved 25 October 2011. ^ Fisk, Robert (18 March 2011). "First it was Saddam. Then Gaddafi. Now there's a vacancy for the West's favourite crackpot tyrant". The Independent. Retrieved 29 November 2016. ^ Vlasic, Mark (2012). "Assassination & Targeted Killing – A Historical and Post-Bin Laden Legal Analysis". Georgetown Journal of International Law: 261. ^ "Col Gaddafi killed: convoy bombed by drone flown by pilot in Las Vegas". The Daily Telegraph. 20 October 2011. Retrieved 28 March 2017. ^ a b Chivvis, Christopher S.; Martini, Jeffrey (2014). Libya After Qaddafi: Lessons and Implications for the Future (PDF). RAND Corporation. pp. 13–16. ISBN 978-0-8330-8489-7. ^ McQuinn, Brian. After the Fall: Libya's Evolving Armed Groups. ^ Kirkpatrick, David D. (1 November 2011). "In Libya, Fighting May Outlast the Revolution". The New York Times. Retrieved 16 November 2011. ^ Meo, Nick (31 October 2011). "Libya: revolutionaries turn on each other as fears grow for law and order". The Telegraph. Retrieved 16 November 2011. ^ Wehrey, Frederic (24 September 2014). "Ending Libya's Civil War: Reconciling Politics, Rebuilding Security". Carnegie Endowment for International Peace. Retrieved 29 November 2016. ^ Abuzaakouk, Aly (8 August 2016). "America's Own War Criminal in Libya". Huffington Post. Retrieved 29 November 2016. ^ Schuchter, Arnold (2015). Isis Containment & Defeat: Next Generation Counterinsurgency. iUniverse. ^ Hauslohner, Abigail (24 September 2012). "Libya militia leader: Heat-seeking missiles, other weapons stolen during firefight". Washington Post. Retrieved 25 September 2012. ^ "Libyan demonstrators wreck militia compound in Benghazi". Al Arabiya. 21 September 2012. Retrieved 24 September 2012. ^ National Post View (24 February 2015). "Stabilizing Libya may be the best way to keep Europe safe". National Post. Retrieved 22 March 2015. ^ a b c Stephen, Chris (29 August 2014). "War in Libya – the Guardian briefing". The Guardian. Retrieved 19 February 2015. ^ "Bashir says Sudan to work with UAE to control fighting in Libya". Ahram Online. 23 February 2015. Retrieved 24 March 2015. ^ "Libya's unity government leaders in Tripoli power bid". BBC News. ^ Elumami, Ahmed (5 April 2016). "Libya's self-declared National Salvation government stepping down". Reuters. ^ "Libya Oil Chiefs Unify State Producer to End Row on Exports". Bloomberg News. 3 July 2016. ^ Shennib, Ghaith (22 August 2016). "Libya's East Rejects Unity Government in No-Confidence Vote". Bloomberg News. ^ Alexander, Caroline; Shennib, Ghaith (12 September 2016). "Libya's Oil Comeback Derailed as Former General Seizes Ports". Bloomberg News. ^ El Wardany, Salma (16 November 2016). 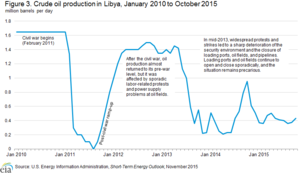 "Libya to Nearly Double Oil Output as OPEC's Task Gets Harder". Bloomberg News. ^ Sarrar, Saleh; El Wardany, Salma (4 January 2017). "Libyan Oil Port Said to Re-Open as OPEC Nation Boosts Output". Bloomberg News.